We're just a group of folks that believe this is an idea worth spreading. 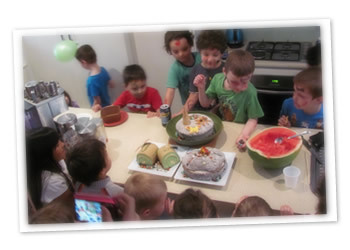 We've seen too many modern kids parties send old-fashioned values like gratitude and cherishing out the door. We also see far too much toy plastic, over-packaging, finite resources and carbon emissions used up like there's no tomorrow. Well, we're big on tomorrow. We believe our children's beautiful birthdays should be good for them, for their families, their friends, and for the planet we call home. And we've seen from experience how much kids love the experience. The first ever dollar party held on 4th March 2011!